Dr. Linda Rigali shows off a model of traditional braces, which have been replaced for many patients by newer, more cutting-edge models. Dental care has come a long way in the past few decades, with high-tech equipment, less noticeable materials, and less intrusive procedures the order of the day. For proof, look no further than how the art and science of braces have evolved. In short, area dentists say, there’s never been a better time to straighten those teeth. As long as there have been mouths to feed, there have been crooked teeth. And since ancient times, it seems, we’ve been trying to fix them. As early as 400-300 BC, the Greek physician Hippocrates was looking for ways to align teeth, and there’s archeological evidence that ancient people sometimes wrapped metal bands around their teeth, presumably in an effort to straighten them. Apparently, even Cleopatra wore braces. While no one knows for sure how effective those early efforts were, experts say the ancients were on the right track, applying sustained pressure to teeth in an effort to move them into a more favorable position. It’s essentially the same thing we do today, albeit with much more elegant systems (and presumably less pain), through the practice of orthodontics, a dental specialty that deals with the diagnosis, prevention, and correction of teeth that are not properly aligned. Modern-day orthodontics was born when, in 1728, French dentist Pierre Fauchard first used a device called a Bandeau, a horseshoe-shaped piece of iron that helped expand the palatal arch. By the mid-19th century, orthodontia was recognized as a science, and by 1901, orthodontists had their own scientific organization, the American Society of Orthodontics, which evolved in the 1930s to the American Assoc. of Orthodontists. Early training was minimal. The first school of orthodontics, which opened in 1899, offered a three- to six-week course for dentists. Today, the training is extensive, and generally includes four years of undergraduate study, four years of graduate study at a dental school, and two years of post-graduate study in orthodontics. Just as education has changed over the past century, so, too have materials and techniques, improving outcomes, as well as the patient experience — and much of that has occurred in just a generation or two. As braces gained popularity during the 20th century, dentists wrapped bands around each tooth and connected them by a wire, inserted into brackets, or braces, that were cemented to the teeth. Gold and silver were popular materials, although each had its drawbacks: gold was expensive and soft, requiring more frequent adjustments; silver was less expensive, but also less malleable. Dr. Linda Rigali says braces can treat issues like overbites, underbites, crowding, excess spacing, and asymmetries. Those materials were largely replaced by stainless steel in the early 1960s, but, even then, braces were bulky and uncomfortable, said Dr. Linda Rigali of Rigali & Walder Orthodontics in Northampton. Materials have improved further since Rigali opened her practice 31 years ago. “We use nickel-titanium, which holds its shape and gets more active with body temperature,” she said. “They very slowly express the forces over a period of time. It’s just as effective as the old ones, but definitely a lot more gentle,” and not as painful as some adults might remember from their own childhoods. That might help account for the fact that more than 4 million people in the U.S. are undergoing orthodontic treatment, according to the American Assoc. of Orthodontists (AAO). A century ago, most patients made their first trip to an orthodontist in their 20s, but today, the AAO recommends children see an orthodontist at about 7 years old, when the permanent teeth are emerging, to evaluate whether they will need braces and, in some cases, to do interceptive treatments that can change problematic growth patterns. Indications for treatment with braces are predominantly functional, Rigali says, and can include overbites, underbites, crowding, excess spacing and asymmetries. Once a need for braces is established, a treatment plan will be devised. A first visit will include a thorough examination, close-up photographs, and X-rays, which have also changed for the better, Rigali says, since she joined the profession. Among the more dramatic recent advances is the use of nearly invisible Invisalign braces, which are taking off in the industry; about 35% of Rigali’s patients now use the clear, flexible, lightweight plastic aligners that combine advanced 3-D computer-graphics technology with the 100-year-old science of orthodontics. 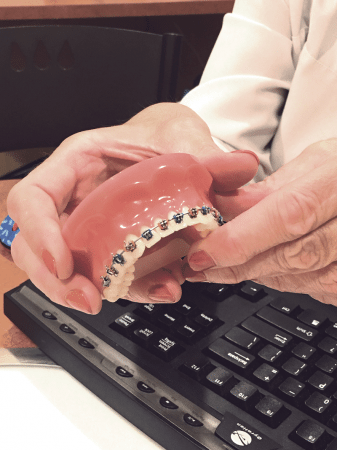 While the theory is much the same as traditional braces — that slow, steady pressure will move teeth — the material and the treatment plan are revolutionary, Rigali said. 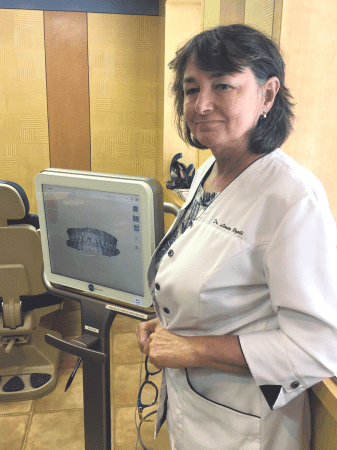 For example, the use of 3-D scanning technology has nearly eliminated the need for dental impressions, which require pressing a tray of gooey material into the top and bottom teeth. Dr. Janice Yanni says she takes advantage of modern technology to make visits fun for patients. The advent of the Invisalign braces in 1997 might well have contributed to the 40% rise in the number of adults who sought orthodontic treatment between 1996 and 2015, as reported in the Wall Street Journal. About 20% of Rigali and Yanni’s patients are adults, and many request Invisalign braces, which are used by about 30% of Yanni’s patients in total. As the practice of orthodontics has changed, so, too, have orthodontists’ offices, says Craig Sweitzer, the owner of Craig Sweitzer & Co. General Contractors, who has built some 200 dental offices over his 34-year career. Sweitzer says he and his sons Michael and Brian, who have joined their father’s company, work closely with the doctors on office design. The company does collaborate with architects, as is required by law. “In Massachusetts, you have to have a registered architect to pull a building permit for a commercial project, anything over 35,000 cubic feet,” Craig Sweitzer said. 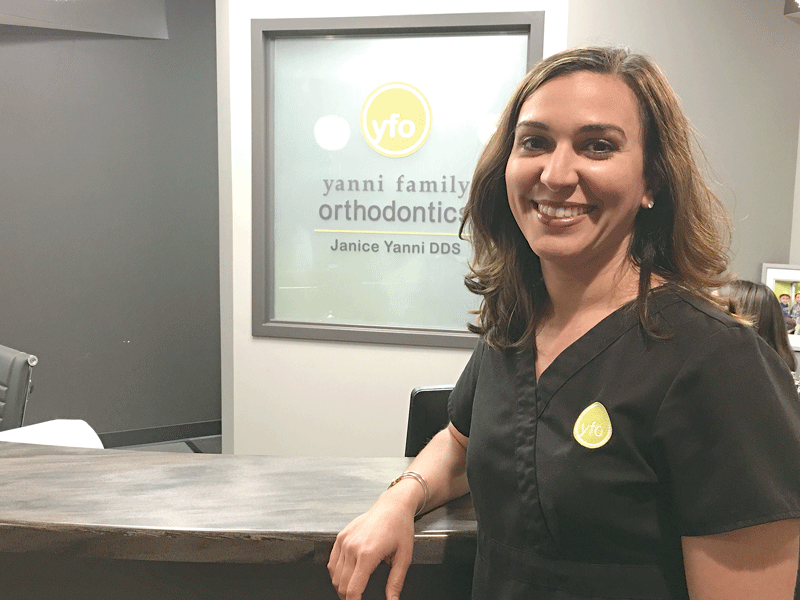 There’s more to keep up with these days than advances in the science and technology of orthodontics, and practices like Yanni’s and Rigali’s take advantage of interactive and social media to help make the experience a pleasant one for their tech-savvy young customers. At Yanni’s Longmeadow office, for example, patients can use one of four iPods set up at a station in the waiting room, designed by Michael Sweitzer with input from an IT specialist. Rigali & Walder also holds virtual contests, such as Where in the World is Rigali and Walder Orthodontics? and Hero Dad, which are designed to keep young patients entertained and engaged. “You’ve got to make it fun,” Yanni said. Much of today’s research in orthodontia focuses on the biology of tooth movement, and looking for ways to speed up the process. “Everybody wants it done faster,” Rigali said. One new device, AcceleDent, appears to move things along. Used with traditional or Invisalign braces, the vibrating mouthpiece is worn for 20 minutes a day to stimulate bones, which leads to faster bone remodeling. Another promising technique, Propel Orthodontics, uses micro-osteoperforations to accelerate tooth movement and bone regrowth. In spite of advancements that promise to hasten the process, Yanni cautions her patients that there are no quick fixes. She tells them to plan to commit to a two- or three-year period, and once those teeth are straight, a retainer will still be required to keep them from moving back.